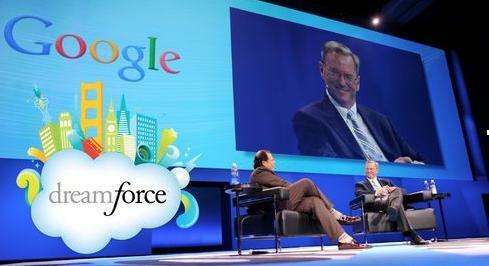 Last Thursday afternoon Eric Schmidt, Chairman of Google, took the stage at Dreamforce 2011. I really looked forward to hearing him speak for he first time and I was not disappointed at all. I thoroughly enjoyed every single minute of Eric Schmidt’s hour-long keynote and it went by in a flash. He is an incredibly brilliant and well spoken individual. Eric Schmidt and Marc Benioff discussed the future of cloud computing and shared priceless insight on topics ranging from job creation in American manufacturing, politics, entrepreneurship, and management. To learn more about Eric Schmidt’s views on the aforementioned topics and what the next Facebook might look like, listen to the full keynote below. This entry was posted in Innovation, Technology and tagged Cloud computing, Eric Schmidt. Bookmark the permalink.